/ Barbecue / 1st Place BBQ & Brew $9.99|#2 VIRGINIA vs GEORGIA TECH NCAA HOOPS & TEXAS HOLD’EM POKER! 1st Place BBQ & Brew $9.99|#2 VIRGINIA vs GEORGIA TECH NCAA HOOPS & TEXAS HOLD’EM POKER! 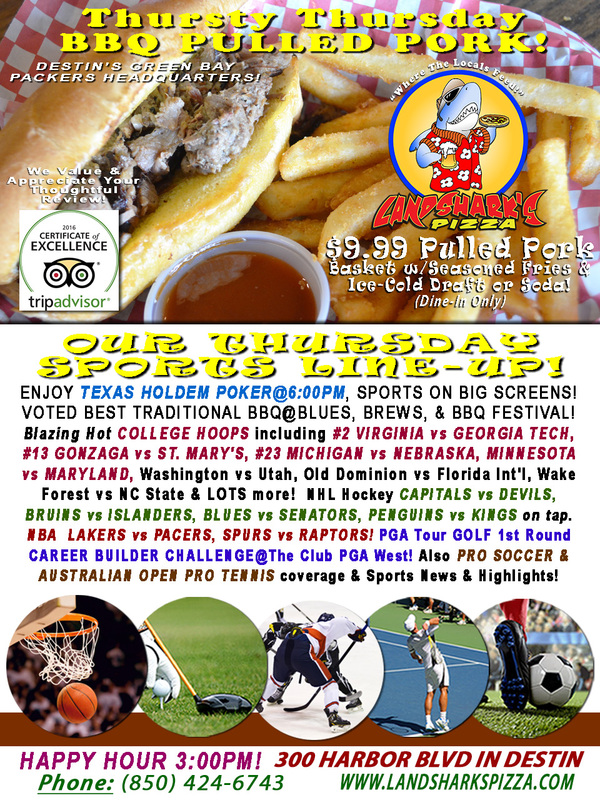 Heart-racing College Basketball action to go with AMAZING BBQ FLAVOR in Destin along with Hockey, NBA Hoops & TEXAS HOLD ‘EM! Warm your bones with todays’ special on Destin’s MULTI-YEAR 1st Place Blues, Brews & BBQ Festival Winner, Slowly smoked, tender, juicy & delicious FALL-OFF-THE-BONE PULLED PORK basket with Succulent Seasoned Fries and your choice of an icy-cold domestic Draft Beer (or Soda) – Just $9.99 (dine-in)! 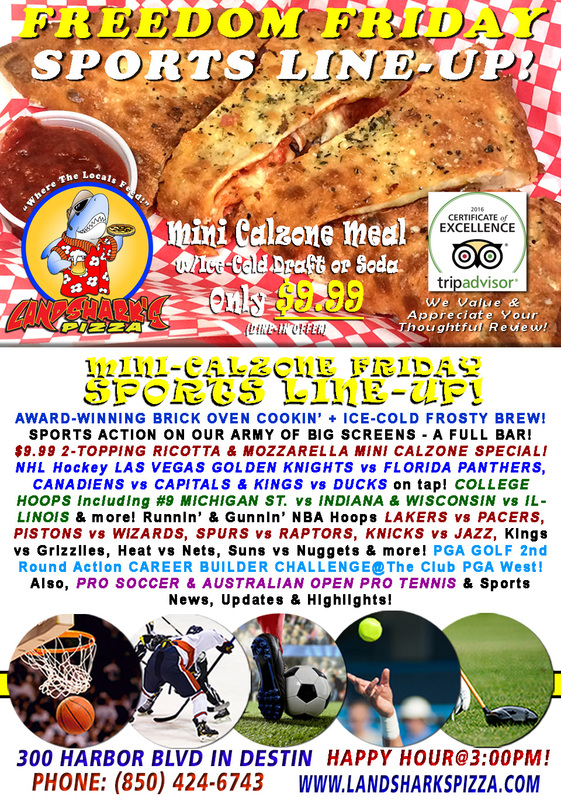 SPORTS ON OUR ARMY OF BIG SCREENS – Blazing Hot COLLEGE HOOPS including #2 VIRGINIA vs GEORGIA TECH, #13 GONZAGA vs ST. MARY’S, #23 MICHIGAN vs NEBRASKA, MINNESOTA vs MARYLAND, Washington vs Utah, Old Dominion vs Florida Int’l, Wake Forest vs NC State & LOTS more! NHL Hockey CAPITALS vs DEVILS, BRUINS vs ISLANDERS, BLUES vs SENATORS, PENGUINS vs KINGS, Sharks vs Avalanche, Golden Knights vs Lightning, Sabres vs Rangers, Maple Leafs vs Flyers on tap. NBA action includes LAKERS vs PACERS, SPURS vs RAPTORS, Wizards vs Pistons, Knicks vs Jazz! PGA Tour GOLF 1st Round CAREER BUILDER CHALLENGE@The Club PGA West! Also PRO SOCCER & AUSTRALIAN OPEN PRO TENNIS coverage plus plenty of other Sports Broadcasts, Sporting News, Analysis, and Commentary! 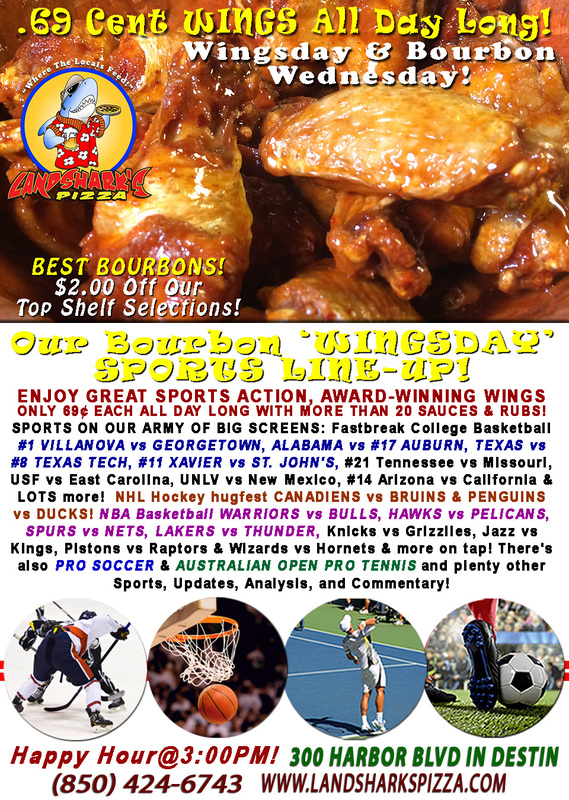 Previous Post: « Landshark’s WINGSDAY only 69¢ each NCAA #1 VILLANOVA vs GEORGETOWN & BAMA vs #17 AUBURN All Bourbons $2 OFF!